Saxton Temple Pope was born on September 4, 1875 at Fort Stockton, Texas, the third in a family of four or six, depending on the source you reference. His father, Benjamin Franklin Pope, was an Army Officer and surgeon, spending most of his career stationed in isolated army garrisons throughout the west. The West during the late 1800's was a harsh and unforgiving environment, a strict task maker largely responsible for nurturing the independence and self-reliance so characteristic of Pope in later life. His childhood companions were not the normal sort, but Indians, cowboys, half-breeds and an assortment of other colorful frontier characters, and as a youngster, camping, hunting, riding, and fishing occupied much of his spare time. A rugged outdoors childhood combined with a natural dexterity and athletic ability helped develop his exceptional skills in "legerdemain, music, surgery and woodsmanship." According to Pope, he experimented with bows and arrows as a youngster. "Every boy goes through a period of barbarism, just as the nations have passed, and during that age he is stirred by the call of the bow. I, too, shot the toy bows of boyhood; shot with Indian youths in the Army posts of Texas and Arizona. We played the impromptu pageants of Robin Hood, manufactured our own tackle, and carried it about with unfailing fidelity; hunted small birds and rabbits, and were the usual savages of that age." Schooling opportunities in the army camps and frontier towns of Popes childhood were limited, but he took advantage of that offered and eventually found his way to the University of California were he was graduated in 1899 with honors and a degree in medicine. Soon after his internship he set up practice in Monterey, a small town outside of San Francisco and married Dr. Emma Wightman, a college classmate. They would raise a family of four children; Saxton Jr., Elizabeth, Virginia and Willard Lee Pope. An event unfolded in 1911 that would chart the course of archery history. Ishi, the last Yahi Indian was captured on the 29th of August in Oroville, California. After several days of confinement in the local jail, he was rescued by Professor T. T. Waterman, an anthropologist from the University of California and brought to San Francisco as a ward of the University of Californias Museum of Anthropology. During 1912, Dr. Pope moved his family to San Francisco and became an instructor in surgery in the University Medical School. It was his work at the University that brought him in contact with Ishi. He later spoke of these beginnings, "From the first weeks of our intimacy a strong friendship grew up between us, and I was from that time on his physician, his confidant, and his companion in archery. He often asked if I were not part Indian, which, although it is not a fact, I naively admitted I was." Under Ishis guidance Dr. Popes interest in archery would resurface. He was taught the Indian method of bow making and went on hunting excursions in the surrounding country with Ishi. On these expeditions Ishi provided valuable lessons in this new system of acquiring game, "We shot rabbits, quail and squirrels with the bow. His methods here were not so well defined as in the approach to larger game, but I was struck from the first by his noiseless step, his slow movement, his use of cover." A year or so later, Ishi received another visitor keenly interested in his archery. Will Compton, who until the recent death of Capt. F. S. Barnes, had been employed by the Oregon bowyer for some 19 years. Compton, just moved to California, made his way to San Francisco to meet Ishi. During this visit, he met Dr. Pope and became his mentor. As Dr. Pope developed his bow making skills, he formed a decided preference for the English longbow of pacific yew. For a detailed look at Dr. Popes bows, check out "A Shot From The Past" in the Jun/Jul 1998 issue of Traditional Bowhunter by Joe St. Charles. According to Joe St. Charles, Art Youngs introduction to this group came in 1915 at the "Panama-Pacific Exposition," where he chanced to meet Will Compton while visiting a popular feature of the Exposition, the Japanese archery gallery. Youngs sincere interest in archery was apparently evident and Compton added another to his list of pupils. Compton is responsible for introducing Young to Ishi and Dr. Pope. During the next year these inseparable companions and knights of the open range would share many trips afield. Dr. Pope, an accomplished woodsman, relished his time camping and roughing with his three varied but close companions and it was during these outings that Dr. Pope and Young polished their skills in hunting and shooting that would prove so important in the coming years. On May 25, 1916 Ishi succumbed to tuberculosis and passed on to a higher hunting ground. Dr. Pope wrote in Yahi Archery (1918) that, "When he died and was cremated according to the custom of his people, we placed by his side some tobacco, ten pieces of dentalium shell, a little acorn meal, a bit of jerky, his fire sticks, a quiver full of arrows, and his bow." 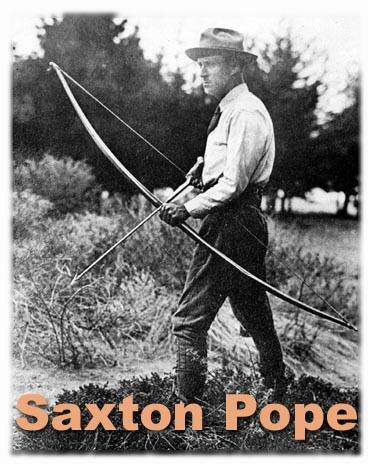 Dr. Popes two other books published by the University of California are The Medical History Of Ishi (1920) and A Study Of Bows And Arrows (1923). The loss of his friend and companion did nothing to lessen Dr. Popes passion for the bow and hunting. Dr. Pope, Young and Compton renewed their habit of camping and hunting with the bow after the death of Ishi, taking everything from birds and small game to deer. Dr. Pope recorded many of these accounts in his classic, Hunting with the Bow and Arrow (1923). Always the adventure seeker, he traveled to Yellowstone Park with Young, challenging the great Bear of America, the grizzly. Buoyed by their success in Yellowstone and accompanied by the writer and archer Stewart Edward White, they ventured to the Dark Continent in search of an even greater challenge, the African lion. During the five month long safari, their trophies included Thompson gazelle, reedbuck, waterbuck, wildebeest, kongoni, eland, jackals, hyenas and assorted small game. The high point of the safari was the killing of several African lions with their bows and arrows, latter documented in Popes The Adventurous Bowmen (1926) and offered from a different perspective in Stewart Edward Whites Lions in the Path (1926). Unlike Maurice and Will H. Thompson, who pioneered and popularized archery in the late 1800's, Pope was both an accomplished bowyer and hunting archer, making all his bows, arrows and accessories. Dr. Saxton T. Pope contracted pneumonia soon after returning from Africa and passed away in 1926.